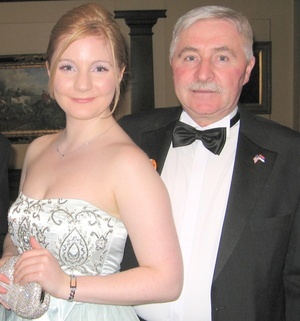 Following the death of his daughter Kate Fitzgerald last year, her father Tom was told she had died from a broken neck after hanging herself at her home. Empty alcohol bottles at the scene suggested she had been drinking heavily. She was also “off her medication”. Months later he was sent the autopsy report. Kate did not die of a broken neck. She died slowly of ligature strangulation. Kate had not stopped taking her medication. The medication levels were clinically spot on. Kate had not been drinking heavily. She died with the equivalent of one drink in her system. Kate’s hyoid bone — a small bone in the neck — was broken. This unattached bone in the neck can only be broken by horizontal pressure. It is extremely rare in suicidal hanging and even more so with a young person. We’ve spoken to a number of legal people on this matter and since the autopsy report, we’ve done a lot of research, and this injury is always a strong indicator of murder. We went back to the Kevin Street gardai. They reluctantly agreed to have another look. Two more weeks and I was told that they had looked and said there was no reason to investigate further. Posted in Misc and tagged Kate Fitzgerald, Tom Fitzgerald at 12:35 pm on September 16, 2012 by Broadsheet.